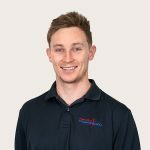 Mitchell graduated from Charles Sturt University’s Orange campus in 2014, then returned home to Canberra to commence working in both sporting and musculoskeletal fields. In his first year of practice, Mitchell was exposed to a wide variety of conditions and clients ranging from high levels athletes, pre- and post-operative rehabilitation clients, to non-active population. Given Mitchell is a competitive and representative athlete himself, his special interests have been directed towards sporting injuries, in particular shoulder and lower limb injuries, as well as back pain. Mitchell utilises biomechanical correction, exercise prescription and various other evidence based practices to get athletes back to their sporting pursuits as quickly as possible. Outside of work Mitchell has played and worked in rugby union and many other sports, although is currently focused on his true love - basketball.